Note: This article relates to the Affiliate Dashboard Sharing pro add-on. After installing and activating the add-on you'll need to configure the settings by visiting the Affiliates → Settings → Integrations tab. 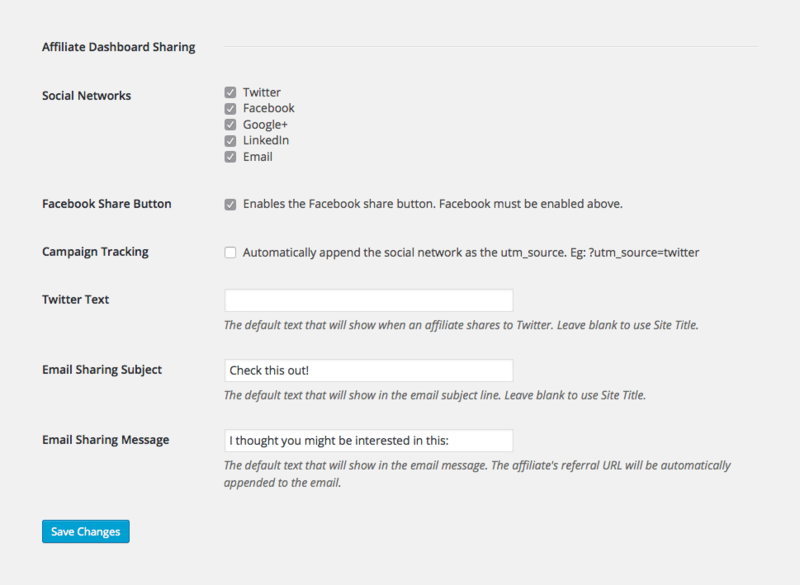 Note: If you do not see the social network buttons appear, remember they will show only when a new URL is generated. To do this, enter a valid URL in the Page URL space and click the Generate URL button. Pre v1.1 Note: If you're manually upgrading from a previous version (pre v1.1), delete the old version or remove the add-on's folder via FTP (you won't lose any data) so you don't end up with 2 versions installed. The add-on's folder name in v1.1 has changed from affwp-affiliate-dashboard-sharing to affiliatewp-affiliate-dashboard-sharing.